About two years ago I was cleaning up stuff that was leftover from my parents’ remodeling of their house. This included several sorts of things such as pretty much anything in my closet, post-college knick-knacks and some stuff from my teenage years. This in particular was a folder that’d be the equivalent of my iPad nowadays; a bunch of writing, picture scraps and half-finished drawings. However when going through this I found an interesting image tucked between some other paper. 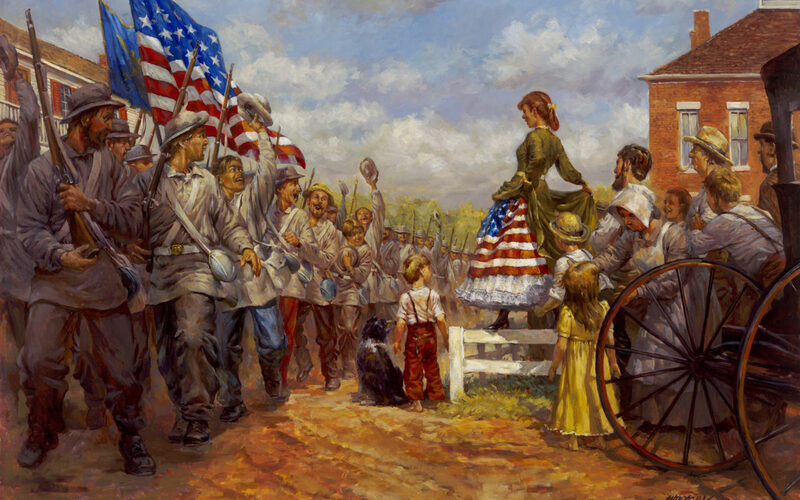 It was a faded color image on copier paper of an oil painting, showing a scene from the Civil War. A girl was featured on the right standing on a fence, lifting her dress to show an American flag hidden beneath. I obviously had stuck it in there years ago, probably over a decade at least. I have no idea why it was in there, but I was guessing it was in there since about 2002-2003. Finding it in 2016, I had no idea what the painting was, who was in it or anything about the story at all.